As the Swans prepare for their 6th season in the Premier League, there has been plenty of transfer speculation regarding players coming and going from the club! Not to mention new owners of course. With less than two weeks until the 2016-17 campaign gets underway at newly promoted Burnley, the lack of activity in the transfer market has caused some Swans fans to go into meltdown with some (on social media) predicting a season of doom and gloom. Three strikers leaving the club during the summer haven’t exactly helped peoples’ blood pressure! The more relaxed folk amongst the Jack Army are quietly satisfied with a positive pre-season and the permanent acquisition of Leroy Fer plus the return of Premier League winner Nathan Dyer (something which even Steven Gerrard can’t say!). Scottish U21 international Oliver McBurnie has also caught the eye up-front. No doubt there will be a few more twists and turns before a ball is kicked at Turf Moor on 13 August but rest assured, no matter what happens between now and then, it’ll be a rollercoaster ride no doubt! But now it’s your chance to get out the crystal ball and cast your predictions for the season ahead without giving the bookies a pound of your hard-earned cash. 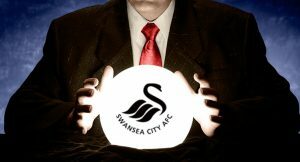 So do you see the Swans struggling or maybe surprising a few people by grabbing a place in Europe next season or even picking up some silverware? Whatever you think, let us know by completing the form below, you never know you might even win a prize!